An antique authentic fireman's water bucket with lid is one of the most highly desired pieces of early fire fighting equipment sought by collectors today. 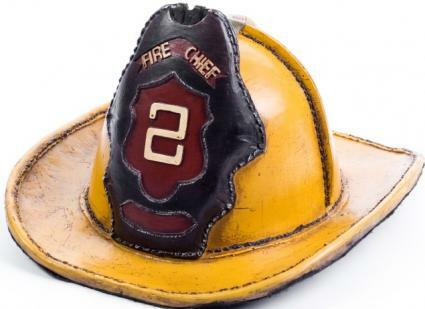 Although firemen's buckets are found at antique auctions, it is extremely rare to find one in very good condition, complete with a lid that still has strong, clear letters and designs. When the word Fire was cried out in an 18th century colonial town, regardless of the time of day or night, the entire town quickly formed two lines that ran from the town well to the building that was on fire. These lines eventually became known as a bucket brigade. Fashioned after the buckets that were dispensed to the people of London after the Great Fire of 1666, the three gallon cowhide buckets had wooden hoops at the brim to make them stronger. The handles were generally made from hemp that was covered with leather. As the fire raged, the men of the town formed one line as they passed the full buckets of water from man-to-man, hoping to extinguish the flames before the fire spread to more buildings. The second line of the bucket brigade was made up of the town's women and children. Their job was to pass the empty buckets back to the well so they could be refilled. The townspeople, along with their leather buckets, were all there was to stop their buildings from being destroyed by the raging fire. Sadly the dry wooden structures built closely together often burnt to the ground despite the efforts of the people. Exhausted townspeople often tossed their buckets into piles after the fire had been put out. In order to easily identify their fire buckets townspeople painted on their names or initials and many added bright designs or emblems. Generally the townspeople had a fire bucket for each fireplace they had in their home and one full of water on their front stoop. There was a colonial law that required a bucket of water on the stoop ready for the bucket brigade in case of a fire. The devastating effect the fires had on colonial towns caused leaders such as Benjamin Franklin to organize the bucket brigades into fire fighting companies. In 1736, volunteer fire units began to form. For example, in Philadelphia six volunteer fire fighting units were organized in a short time. Dutch shoemakers, along with many of the colonists, continued making leather fire buckets to fill the needs of the growing communities. Some of the buckets, which had come to be known as firemen's buckets, were ornately painted with emblems and names of the fire fighting company. Even when a town or city was fortunate to have a hand-drawn pumper it was the bucket brigade, using their leather fireman's buckets that kept the pumper full of water. Bucket brigades were used until the mid 19th century when the steam engine and hose reel were invented. Most of the fireman's water buckets made by colonial cobblers were made without lids. For those that were made with lids, many have been lost over time. There are artists today such as Steven M. Lalioff that create reproductions of firemen's buckets. Like the originals, the reproductions are handstitched cattle hide. Each of the fire buckets is carefully constructed to accurately reproduce the originals. Whether you are a collector or just enjoy antique firefighter memorabilia, viewing an antique authentic fireman's water bucket with lid will surely make you think of a much earlier time in history.